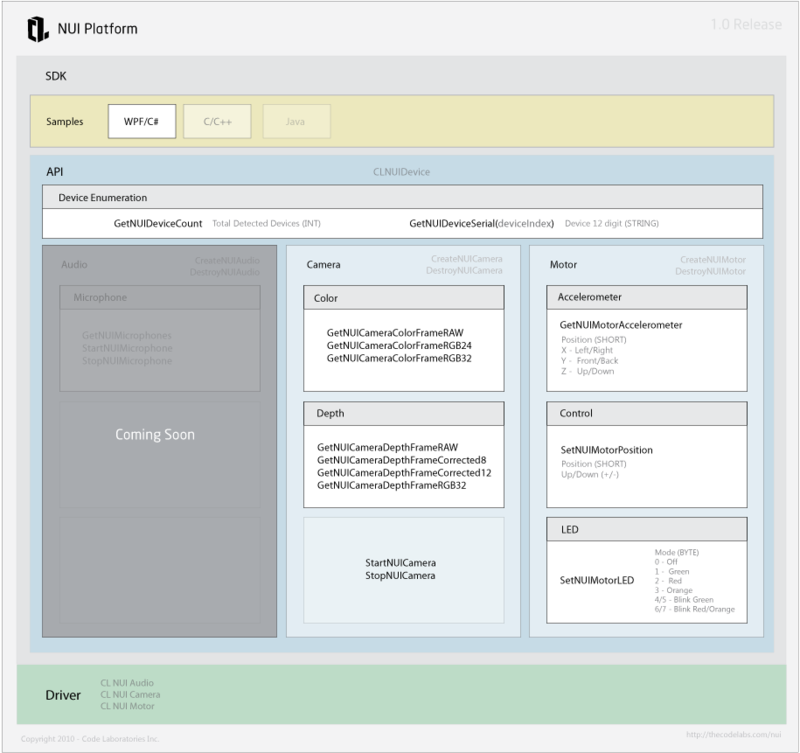 You can review the updates here to get started using the SDK Samples and more. We are proud to release the first preview release of the new CL NUI Platform which consists of an SDK, API and a stable driver for Microsoft’s new Kinect Hardware (Xbox NUI Audio, NUI Camera, NUI Motor and Accelerometer) devices on Windows machines. To start we have a WPF/C# (.NET 3.5) Visual Studio 2010 Sample Applications as well as C API (CLNUIDevice.h, DLL, LIB) and plan on extending the SDK similar to our CL Eye SDK which has Samples for C/C++/C#, Java and DirectShow. Thanks and please share any videos of it in use or feedback while getting started with the CL NUI Platform. As told in nuigroup, very easy and working solution, I do appreaciate this piece of software and the work behind it. Just wondering something : are there any other methods that can be exposed by DLL to achieve more control on hardware and onboard computation ? Great Work Guys, Installed and Working not glitches on my 7 Box. Okey, so when can i start using my PC like they do on minority report? Whats the development pathway for what you doing? OR simply providing a community driver? You guys entering Googles competition for “Cool App”? Great job, I think it was one of the devices that have been hacked sooner. I have a question. When you set Kinect in the console menu you can see the recognition of the skeleton that is capable of. Is this the image processing is done with software from the device or from the console? Cannot create instance of ‘MainWindow’ defined in assembly ‘CLNUIDeviceTest, Version=1.0.0.0, Culture=neutral, PublicKeyToken=null’. Exception has been thrown by the target of an invocation. Error in markup file ‘MainWindow.xaml’. 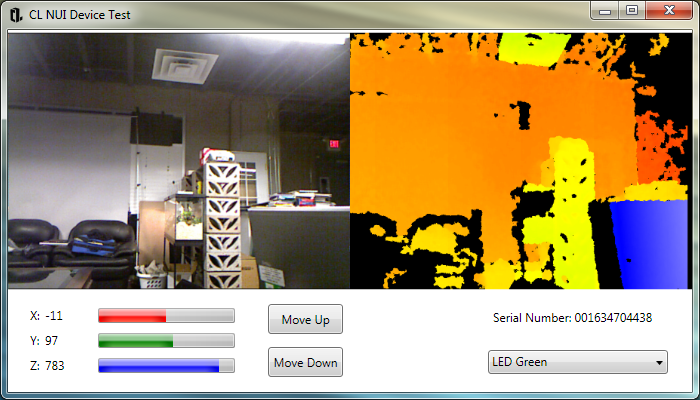 Here is an example using the CL NUI Platform DLL with Python to pull data from the Kinect. It saves out a PNG of the RGB camera, and what I believe is a valid 16-bit greyscale TIFF of the depth camera. It works on eclipse but when running with processing it seems to have the same problem i had with recent ps3eye drivers. It keeps saying it can’t find the DLL file. This was tested on win7 64bit. If there is anyone out there using java/processing, i would appreciate some feedback. @Liam that is beautiful work man! I hope you don’t mind if we highlight this as example video for SDK usage… really amazing work! @Pixel I’ll try and grab the latest processing and try out your wrapper, is it using JNI? Can’t find DLL here too..
is there any way to specify the path? It seems we’re having problems with processing as PS3Eye driver did. Even if setting up a custom path it simply can’t find the dll or load it. Nonetheless it runs just fine with java. I would like people to try the lib anyway, as other OS versions might give different results. So far only tested on Windows7 64bit. what’s new in release 1121 ? a software like WIITUIO but with kinect is beautiful. i think you can develop this software in 2 days. Fantastic job getting a Windows driver and API out there so quickly! I previously tried to save out the image to a static bitmap but did not have any luck…I notice in the C# implementation that there is a NUIImage class which does the conversion but have not been able to port this to C++ as yet. Has anyone had any luck with the C/C++ API or does anyone have any advice? I have been able to compile and run the C# program ok, but would really like to use C++ for best performance and compatibility reasons. I’m trying to get a depth map out of the driver to work with inside of C#. // call this right after depthImage.Invalidate() on the main worker thead. But that is not ideal at all. I’d like to be able to use GetCameraDepthFrameRAW but can’t figure it out. The closest I’ve come is the following but it doesn’t appear to be correct. What is the format of the data returned from GetCameraDepthFrameRAW? What is the resolution of the depth camera? I’ve read that it’s 320x240 @15fps and 11 bit-depth but that doesn’t appear to be happening. Thanks for your help and thanks for the library.